These authentic Italian cake recipes make the best dessert cakes you've ever tasted. Whether it's the classic Margarita Cake, the historic Portuguese Cake, or the delicately textured Almond Cakes, you are in for a wonderful taste experience. Potato meal (flour), three ounces; sugar, six ounces; four eggs, lemon juice. Beat well the egg yolks with the sugar, add the potato meal and the lemon juice and stir everything for half an hour. Finally, beat well the whites, and mix the rest, stirring continually but slowly. Pour the mixture in a smooth and round mold, greased with butter and sprinkled with powdered sugar. Put at once in the oven. Remove from the mold when cold and dust with powdered sugar and vanilla. Granulated sugar, nine ounces; very fine Hungarian flour (or substitute any fine cake flour), five ounces; sweet almonds with some bitter ones, two ounces; six whole eggs and three egg yolks; taste of lemon peel. After skinning the almonds in warm water and drying them well, grind or better pound them well together with a tablespoonful of sugar and mix well with the flour. Put the rest of the sugar in a deep dish with the egg yolks and the grated lemon peel (just a taste) and stir with a ladle for a quarter of an hour. In another dish beat the six whites of egg and when they have become quite thick mix them with other ingredients stirring slowly everything together. To bake, place the mixture in a baking tin greased evenly with butter and sprinkled with powdered sugar and flour. Corn meal, seven and a half ounces; wheat flour, five and a half ounces; granulated sugar, five and a half ounces; butter, three and a half ounces; lard, two ounces; a pinch of aniseed, one egg. For this Italian cake recipe, mix together the corn meal, the flour, and the aniseed and knead with the butter, the lard and the egg that quantity that you can, forming a loaf that you will put aside. What remains is to be kneaded with water forming another loaf. 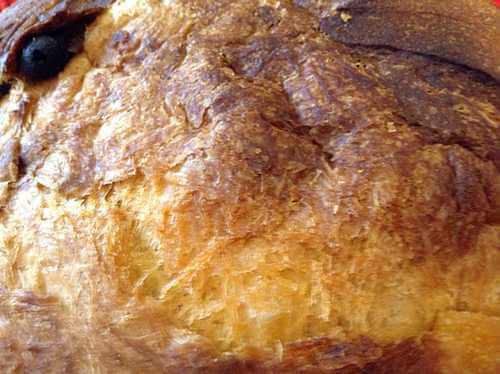 Then mix the two loaves and knead a little, not much, because the dough must remain soft. Flatten with the rolling pin until it becomes one quarter of an inch thick, sprinkle with flour, and cut in different sizes and shapes with thin stamps [or cutters]. Grease a baking tin with lard, sprinkle with flour, glaze with the egg, bake and dust with powdered sugar. The ingredients called for in this old fashioned Italian cake recipe are about six pounds of quinces and four pounds of granulated sugar. Put on the fire the apples covered with water, and when they begin to crack remove them, skin and scrape to put together all the pulp. Rub the latter through a sieve. Put back the pulp on the fire with the sugar and stir continually in order that it may not attach to the bottom of the kettle. It will be enough to boil for seven or eight minutes and remove when it begins to form pieces when lifted with the ladle. Now, in order to prepare the quince cake spread it on a board to the thickness of about a silver dollar and dry it in the sun covered with cheese cloth to keep away the flies. When it is dry, cut it in the form of chocolate tablets and remove each piece from the board passing the blade of a knife underneath. If it is wished to make it crisp, melt about three and a half pounds of granulated sugar with two tablespoonfuls of water, and when the sugar has boiled enough to "make the thread" smear every one of the little quince cakes with it. If the sugar becomes too hard during the operation put it back on the fire with a little water and make it boil again. When the sugar is dry on one side and on the edge, smear the other side. Sweet almonds, five ounces; granulated sugar, five ounces; potato meal (flour), one and a half ounces; three eggs; one big orange or two small. First mix the yolks of the eggs with the sugar, then add the flour, then the almonds skinned and chopped fine, then the orange juice (through a colander), then a taste of orange peel. Finally add to the mixture the whites of the eggs well beaten. Put in a paper mold greased evenly with butter, with a thickness of about an inch and bake in a very moderately hot oven. After baked, cover with a white glaze or frost, made with powdered sugar, lemon juice, and the white of eggs. Farina, six and a half ounces; sugar, three and a half ounces; pine seeds, two ounces; butter, a small piece; milk, one quart; four eggs, a pinch of salt, taste of lemon peel. For this traditional Italian cake recipe, cook the farina in the milk and when it begins to thicken pour the pine seeds, previously chopped fine and pounded with the sugar, then the butter, and the rest, less the eggs which must be put in last when the mixture has completely cooled. Then place the whole well mixed in little molds, greased evenly with butter and sprinkled with bread crumbs ground fine, and bake. Sugar, five and a half ounces; sweet almonds, three ounces; egg yolks, five; milk, one pint. To begin making this Italian cake recipe, skin the almonds and chop them in little pieces about as big as a grain of wheat. Put on the fire two-thirds of the sugar and when it is all melted pour the almonds and stir continually with the ladle until they have taken the color of cinnamon. Then put them in a tin greased with butter and when they are cold, pound them very fine with the remaining third of sugar. Add the yolks and then the milk, mix well, and pour the mixture in a mold with a hole in the middle and greased evenly with butter. Place the mold in a double boiler so that it will be cooked by steam. Ingredients: Ground rice, ground maize, sugar, one orange, eggs, salt, cream, Maraschino, almonds, preserved cherries. Weigh three eggs, and take equal quantities of castor sugar, butter, ground rice, and maize (the last two together); make a light paste with them, but only use one whole egg and the yolks of the two others, add the scraped peel of an orange and a pinch of salt. Roll this paste out to the thickness of a five-shilling piece, color it with the yolk of an egg and bake it in a cake tin in a hot oven until it is a good color, then take it out and cut it into four equal circular pieces. Have ready some well-whipped cream and flavor it with Maraschino, put a thick layer of this on one of the rounds of pastry, then cover it with the next round, on which also put a layer of cream, and so on until you come to the last round, which forms the top of the cake. Then split some almonds and color them in the oven, cover the top of the cake with icing sugar flavored with orange, and decorate the top with the almonds and preserved cherries. Ingredients: Sponge cake, jam, brandy or Maraschino, cream, pineapple. 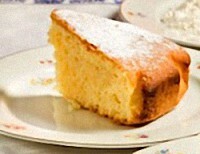 For this Italian cake recipe, make a medium-sized sponge cake; when cold cut off the top and scoop out all the middle and leave only the brown case; cover the outside with a good coating of jam or red currant jelly, and decorate it with some of the white of the cake cut into fancy shapes. Soak the rest of the crumb in brandy or Maraschino and mix it with a quarter of a pint of whipped cream and bits of pineapple cut into small dice; fill the cake with this; pile it up high in the center and decorate the top with the brown top cut into fancy shapes. 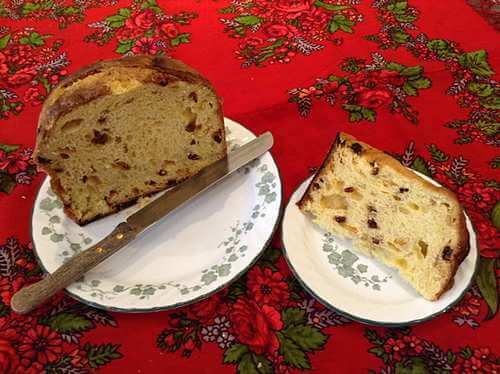 Bake a traditional Italian Panettone Cake for Christmas. 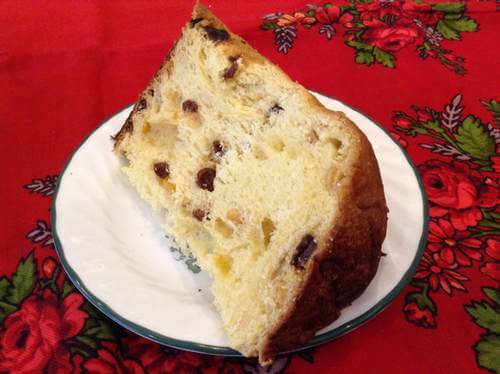 Panettone is a delicious sweet bread that's loaded with bits of fruit, orange/lemon zest, golden raisins, and chopped almonds. It's baked in a distinctive cylindrical mold making it a Christmas cake like none other. You'll enjoy trying this Italian cake recipe. Preheat oven to 325°F. Grease two 16-ounce empty coffee cans or two 6 x 4-inch panettone molds. Mix together flour, baking powder, cardamom, salt, and ginger. Beat together eggs, egg yolks, and sugar until thick and pale yellow in color. Beat melted butter into the egg mixture. Alternately add flour mixture and milk to egg mixture. Then, stir in raisins, dried fruit, nuts, orange peel, and lemon peel. Spoon cake batter into prepared cans, dividing amount evenly. Place cans, batter-side up, on a baking sheet. Bake panettone at 370°F until top is golden brown and a wire cake tester inserted in the center comes out clean, about 1 hour or so. If necessary, cover can tops with aluminum foil toward end of baking time to prevent over browning. Carefully slide loaves from cans (tapping the can's bottom helps), transferring them to a baking sheet. Return to oven and bake panettone until crusty, about 5 to 10 minutes more. Transfer loaves to a wire rack to cool. Dust with confectioners' sugar. Allow your panettone to cool completely before slicing. Can be stored in an airtight container for up to one week. 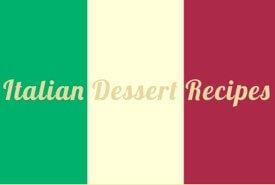 Be sure to keep this Italian cake recipe handy for whenever you desire to serve a special cake. The Italian people have long enjoyed a deserved reputation for their skill in perfecting delicious dessert cakes, and these classic Italian cake recipes represent some of their finest creations. Besides the classic Margarita cake, the creamy Cremona Cake represents one of the best Italian cream cake recipes; plus, there's the trifle-like Cake alla Tolentina recipe — you'll want to make them both. Really! You'll quickly come to appreciate the delicious, Old World taste of these rich yet wholesome dessert cakes. As Grandma often said, the proof is in the eating, and you'll find plenty of proof here! Ricette Italiane originali.